Another issue for these companies is the recharge. How do they get the bikes and scooters recharged that run on electricity? Not only do bikes need to be relocated so there is a balance around the desired area, but e-bikes and e-scooters need to be charged. 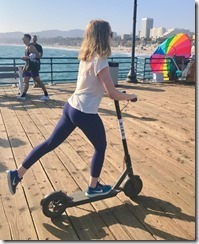 Lime now looks for Lime Juicers to pick up the scooters and charge them wherever possible. Juicers can make $20 a night charging a scooter and returning it to a street corner the next day before 7am. Some Silicon Valley firms have invested in these startups including Andreessen Horowitz who bet $132 million on LimeBike. These companies look to China where wide-spread use of the bikes has changed the way people get around and reduced congestion on the road-ways. But China has also been rough on many of the companies that started bike-sharing services, causing them to go bankrupt within a two year period. Investment in these types of companies has skyrocketed from $288 million in 2016 to over $2.6 billion last year. Lime is now valued at one billion dollars while Bird is raising money at a double that valuation. There is little data about the over-all costs and profit since the companies tend to be new private enterprises and they have no obligation to report their ridership nor their revenue. There have been deals with technology companies for new investment into the Chinese bike sharing market. This investment leads some to believe the mobile data of the bike users will be shared for profit at some point. In the US, companies are claiming that all revenue is from riders alone. Uber recently invested in Lime and also put some cash into the company. The partnership has yet to develop. As the market matures and less companies survive, some feel the prices will go up. Other’s see subscriptions as a great way for the companies to earn a consistent profit. Lime currently offers LimePrime for $29.95 giving one $100 in ride credits. Students and Facility get the subscription at half the price. If you consistently need a vehicle to handle the final mile of your commute, the subscription would be great. The final issue for the companies is waste. The bikes and scooters get damaged and need repair. Reports in some cities have them being left in water-ways, in trees, and broken on the streets. City managers would rather have the companies clean up the damaged vehicles but this creates additional costs for the companies. Juicers and Chargers are to report damage and might begin to do miner repairs. The final data is not available but there is a lot of interest and a lot of money coming to the bike and scooter sharing industry. Stay tuned to see if this will be something that will last or another Segway type dud.